A week ago, I planted a selection of tree seeds – five different species of wattle (Acacia spp. ), poinciana (Delonix regia), jacaranda (Jacaranda mimosifolia) and honey locust (Gleditsia triacanthos). Today I noticed that some of them (notably the wattles and poinciana) are germinating already. In spite of torrential rain, the tiny, delicate seedling heads are poking up through the soil, seed cases still covering their baby seed leaves. I’m so pleased 🙂 I know it’s silly, but I love seeing baby plants emerge, especially baby trees. It also means I did pick the right time of year to plant them, just intot he beginning of the wet but before the weather cools down. Not that Perth gets that cold, even out in the hills. Today I started the next phase of the seed planting plans: the vegetable seeds. I haven’t managed to plant them all; there are way too many for that. I went on a bit of a seed-buying spree a while ago, so I now have many packets of seeds, many varieties of each thing, all heading towards the end of their “best before” (i.e. easily germinates if planted before) date. This afternoon, so far, I’ve planted the eggplants (Mini Purple Oblong, Green Oblong, Rosa Bianca, Pea Eggplant, Udamalapet, and Small White), capsicum (Alma Paprika and Sweet Chocolate), chilli (Chilli Fatalii), and tomatoes (Roman Speckled, Reisetomate, Costuleto Genovese, Red Fig, Jaune Flamme, and the seeds I saved from my mum’s garden last summer, for some sort of delicious cherry tomatoes). So, all the nightshades, really. So.. yeah. I still have a lot of planting to do, even just planting the autumn and winter varieties (and a few of the ones which recommend spring sowing, but which I think should be sown in autumn – like tomatoes). But it’s a good feeling watching the seeds sprout. And it should mean I have a beautiful productive kitchen garden this spring & summer. 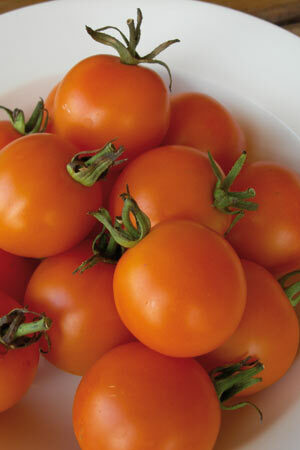 There are a multitude of tomato varieties, ranging from black and purple through every shade of red, pink, orange and yellow to the ones which are green when ripe. Most of them taste better than the standard supermarket tomato varieties available in Australia. Diggers Seeds holds annual taste tests of a selection of varieties, and the supermarket variety they scored for comparison got only 42.46% approval, while the heritage varieties ranged from 60% to 77%. 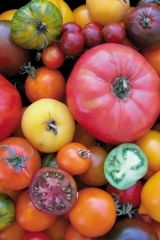 Not all good tomato varieties are heirloom or heritage varieties, though. 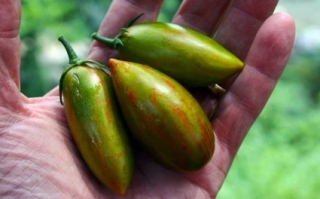 There are still plant breeders out there working on annual vegetables like the tomato, creating new varieties that breed true (as opposed to the F1 hybrids, which do not). The Modern Farmer magazine has an article on a new tomato variety called Lucky Tiger, bred by Fred Hempel of Baia Nicchia Farm in Sunol, California. It looks beautiful, although since it’s in the US and I’m in Australia I haven’t had a chance to try it. As with TV and movies, we have to wait a long time to get seeds to new plant varieties, when we get them at all. Mr Hempel hasn’t said what the full parentage is of his Lucky Tiger, but he said that one of the direct parents is Blush. Blush, released in 2011 (and available from Seeds of Change and from Artisan Seeds), is an open pollinated tomato variety, selected by Mr Hempel from an original cross between Maglia Rosa (selected by Mt Hempel, released in 2007) and an un-released variety called Zucchero. I have none of these varieties available to replicate the process that created Lucky Tiger, unfortunately. However, there are many heirloom varieties that I do have access to. Jaune Flamme (aka Jaune Flammee) was declared the equal first winner of the 2013 tomato taste tests held at the Adelaide Botanic Gardens. It’s an indeterminate, heavy yielding old French variety with beautiful persimmon orange skin, a blushed yellow/red interior, and (apparently) a full-bodied, citrus-like flavour. 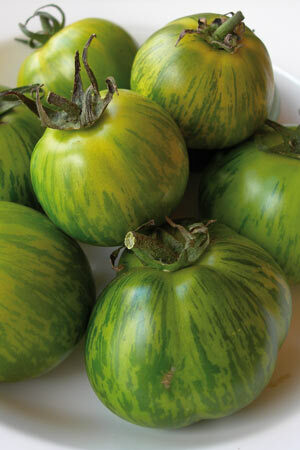 Ananas Noir and Green Zebra also scored highly, and Green Zebra has those beautiful stripes. I know I get overly excited about plant and animal breeding projects, but tomatoes wouldn’t be too tricky. Perth has almost the ideal climate for them – lots of sun, hot summers and mild winters, little chance of mildew. So, amongst my many (many, many, possibly too many) projects, I think I might try some tomato breeding. Jaune Flamme x Green Zebra to begin with, and then perhaps one of the elongated types – maybe Speckled Roman, or Cherry Roma. And in the mean while, I might see if I can get a few different varieties from the farmers market this weekend, and try growing the seeds from the tastiest ones. I might also look up tomato genetics and see what I’m dealing with. All images from Diggers Seeds, except the Lucky Tiger image which is from Modern Farmer. 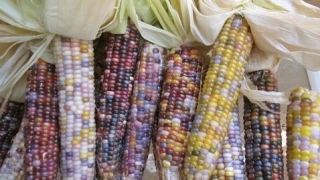 The internet – or at least the organic / heirloom gardening, plant-nerd and permaculturish back alleys of it that I frequent – have been buzzing for the last week or so about a newly discovered variety of corn. 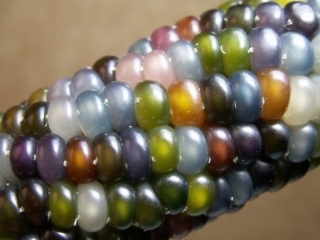 It’s called glass gem corn, although it could as easily be called rainbow corn or even omgponies corn. Whatever the name, it’s beautiful. 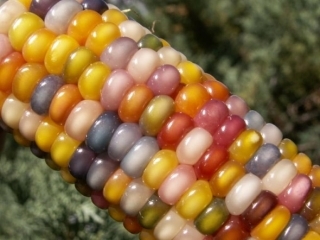 Glass gem is a flint corn variety, also sometimes called Indian corn (as opposed to dent, or field corn, sweetcorn, and popcorn) which means that it’s used for grinding into cornmeal or cornflour rather than as a fresh vegetable. It might work as popcorn, although it’s not specifically a popping variety. You could probably pick it when it’s still young, and roast it; most grinding corn can be used for roasting as well if you pick it at the right stage of development. I really, really want to try growing some. Until this week I’d never considered growing a flint or dent corn variety and grinding my own cornmeal, but I’m now fired up to try it. I love tortillas and corn chips, and I’m quite happy to experiment with adding corn to stews and soups the way I’d normally add pearl barley or lentils. I’ve never had grits, but they sound a lot like the South African mealiemeal porridge that my dad used to love, or polenta. Entirely edible. The only downside is that importing new corn varieties into Australia is quite tricky. Import permits, quarantine inspections, limits on how many seeds can be imported, and then organising those seeds to be grown at a quarantine facility in Australia before quarantine release the resulting plants. I’m not clear on if they even do release the plants, or if they release the seeds of those plants after growing them on for their entire life cycle in a quarantine facility. I’m going to see if I can convince one of the heirloom vegetable seed companies to import some seeds (to grow for more seed, which they can sell next season). Failing that, I’ll have to import some myself.